— China Longyuan Power Group Corp., the nation’s biggest wind power producer, may raise as much as HK$17.5 billion ($2.3 billion) in a Hong Kong initial public offering, said three people familiar with its plan. The renewable energy provider plans to sell 2.14 billion shares at HK$6.26 to HK$8.16 apiece, said the people who declined to be identified before an official announcement. The top end of the range values the Beijing-based company, which is selling a 30 percent stake in the IPO, at HK$58.3 billion or 28.9 times its 2010 earnings per share as estimated by banks involved in the sale, two of the people said. Four so-called “cornerstone investors”, including companies linked to China Life Insurance Co., Bank of East Asia Ltd. Chairman David Li, Hong Kong-based asset manager Value Partners Group Ltd. and WL Ross & Co. LLC, have agreed to buy shares valued at about $300 million in the IPO, said the two people. Cornerstone investors are guaranteed shares in a Hong Kong IPO in exchange for a promise not to sell the stock for several months. Morgan Stanley and UBS AG are managing the sale. Stocks of companies such as China WindPower Group Ltd. and China Solar Energy Holdings Ltd. have more than doubled in Hong Kong trading this year as the mainland government encourages the use of renewable energy. The nation’s wind-power capacity will rise to 100,000 megawatts by 2020 from at least 20,000 megawatts next year, Zhang Guobao, head of the government’s National Energy Administration, said on May 26. China Longyuan, a subsidiary of state-controlled electricity producer China Guodian Corp., is the nation’s first developer of wind farms and accounted for 24 percent of the nation’s wind-power capacity, according to a Nov. 6 Morgan Stanley report seen by Bloomberg. Its installed capacity of 2.9 gigawatts ranked it the fifth-largest wind power producer globally, the report said, citing data from renewable energy consulting firm BTM Consult ApS. Profit will likely rise 162 percent this year to 885 million yuan ($129.6 million) on increased capacity and electricity generation, the Morgan Stanley report said. Revenue may increase 14 percent to 7.2 billion yuan, it said. Longyuan was capable of generating about 2,630 megawatts of wind power in 2008 and this will be raised to 6,000 megawatts by next year, Vice President Huang Qun said June 2. One thousand megawatts is enough electricity to power about a million homes. Thirty-eight IPOs in Hong Kong in the first 10 months of the year raised a combined HK$107 billion, a survey by the accounting firm Ernst & Young LLP said Nov. 10. That’s 62 percent more than capital raised last year, it said. China, the world’s biggest producer of greenhouse gases, burns coal to produce 80 percent of its electricity and wants at least 15 percent of the nation’s energy to come from renewable sources by 2020. A phone call to Longyuan’s Beijing headquarters late last night wasn’t answered. Noel Cheung, a Hong Kong-based spokeswoman at Morgan Stanley, and Mark Panday, a spokesman for UBS in the city, didn’t reply to e-mail enquiries late last night. VICTORIA and NSW could get two gas-fired power stations, with TRUenergy planning to spend more than $2 billion to slash emissions and provide cleaner power to about 1.2 million homes. But the company says this will depend on it receiving enough compensation under the Federal Government’s Carbon Pollution Reduction Scheme, due to be put to a Senate vote as early as next week. TRUenergy argues that unless it remains profitable, it will be unable to move away from brown coal electricity generation to cleaner technologies. Coal-fired electricity generators are demanding $8 billion to $10 billion in compensation for the introduction of an emissions trading scheme. The Federal Government is offering $3 billion. The Age has learnt that TRUenergy will put a proposal before the Brumby Government within months to build a 1000-megawatt gas-fired power station next door to its 1500-megawatt Yallourn brown coal station. If approved, it will be the first base-load power station built in Victoria since Loy Yang B was commissioned in 1993. The combined cycle gas plant would provide about 13 per cent of Victoria’s base-load power and allow TRUenergy to retire two of Yallourn’s four processing units as early as 2013 when the first 500-megawatt unit is operational. More than 7 million tonnes of greenhouse gas emissions would be saved if the gas power station were to replace Yallourn – just over 10 per cent of Victoria’s total annual emissions. Engineering consultant SKM has been commissioned to assess the site next to Yallourn. The plan is part of a multi-state investment plan that also includes TRUenergy’s proposed Tallawarra B gas power station south of Wollongong, which is being considered by the NSW Government. This would double the size of the existing plant and account for 4 per cent of NSW’s base-load power supply. TRUenergy managing director Richard McIndoe confirmed the proposals to The Age, saying they were vital to keeping the lights on, particularly in Victoria. But he said the projects would go ahead only if its balance sheet, and that of parent company Hong Kong-based CLP Group, was not wiped out as a result of the CPRS. ”The proposed power stations will emit a quarter of the CO2 of the traditional brown coal generators, which they will ultimately replace. Whether or not these power stations proceed represents a test as to whether or not the Government’s CPRS actually ensures low emissions investments to replace existing, emissions intensive coal-fired generation,” he said. Climate Change Minister Penny Wong said the Government’s CPRS would provide more than $3 billion worth of assistance to coal-fired electricity generators to help them transition to a carbon price. But Mr McIndoe said $3 billion ”wouldn’t even come close to providing reasonable assistance” and that $8 billion to $10 billion was the ”bare minimum” needed. Victorian Energy Minister Peter Batchelor said his Government would support the project. ”The task of transforming our energy sector into a cleaner industry is massive, and it’s projects like these that will help us achieve this,” he told The Age. Using Green energy is the trend of different governments throughout the world. After HKSAR government said that she will introduce 10 electric cars in the policy address, another government announced that she will bring green vehicles into the country. On Friday, October 30 at 8:30 PM, “NOW” investigates how the Danish government and Better Place are working together to put electric cars into the hands of as many Danish families as possible. The idea is still having trouble getting out of the garage here in America, but Denmark could be an inspiration. 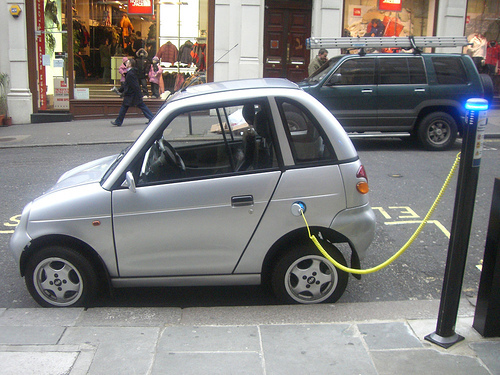 Electric Car can help much in the environment. Demark is a country famous for using green energy. She had developed wind power to produce electricity, setting a good example in creating clear power. Now she go further, not just introducing electric cars in government use, but encouraging the citizens to use electric cars. If the electric plant in Demark produces electricity by fuel such as coal, we may say the electric cars there are not clean enough. However, the electric cars in Demark are powered by wind, and contribute a lot to the Earth’s health. Compare with Demark Government, HKSAR government seem contribute less in environmental protection. Both government talking about electric cars, the former is introducing the cars to the citizens, but the later is introducing 10 cars in government use only. We are both developed region, and we are both enjoying high technology and high quality of life. When we come to the environmental protection issues, we have no excuse. So please require the government to do more in order to clear the air.